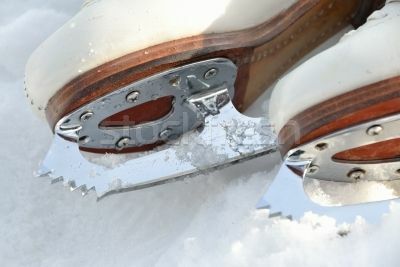 Time to polish up your double toe loops and triple Salchows – or, um, maybe just try and stay upright? 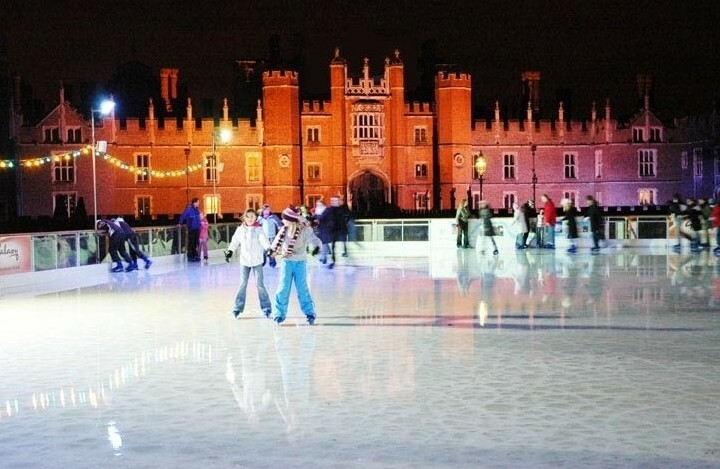 Outdoor ice rinks are starting to pop up all over the place so here’s my round-up of the best places to skate in Bucks, Oxon and beyond. Skate first, dinosaurs after? Or the other way around? The huge rink has a Christmas tree in the middle, fairy lights all around and the museum as backdrop. There’s a cafe/bar, viewing platform and a separate smaller rink for younger kids as well as a carousel. Opening times vary but core hours are 11am-9pm every day except for Christmas Day. 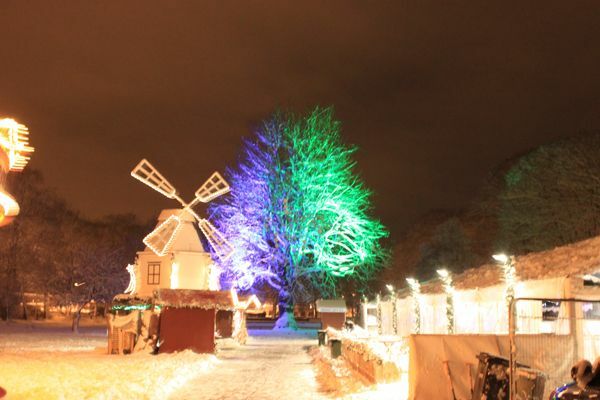 There’s a seriously stunning backdrop for your triple salchow at Henry VIII’s old gaff in Surrey, floodlit with colours for the evening. 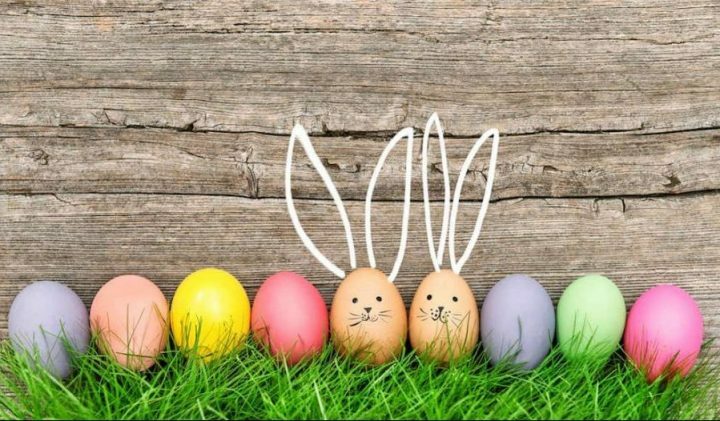 Sessions are one hour (with 15 mins built into that to get your boots off at the end) and there are quieter morning sessions for young children and families. You can also indulge in an afternoon tea. Tickets vary according to peak and off-peak times. There’s also a 10 per cent discount for early bird bookings. Expect to pay about £10-£12 each. 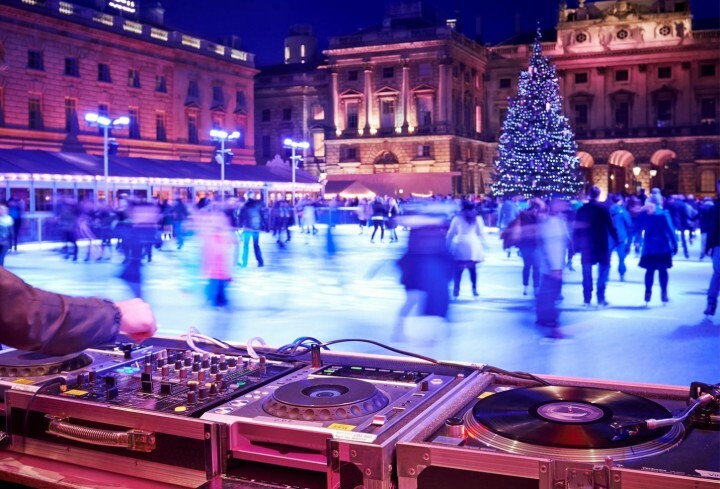 Go clubbing, knock back a Double Chocolossus Hot Chocolate, shop at the pop up Fortnum & Mason Christmas arcade – or, perhaps, er, just skate on the glorious outdoor rink in the fountain courtyard of the neo-classical Somerset House on the banks of the Thames. Book tickets for 1 hour skate sessions (from £7.50), club nights, skate school and all sorts of tempting skate packages here. Closed Christmas Day. Millet’s skate rink is bigger and better apparently (according to them! ), and more to the point, it’s one of the few outdoor rinks in Oxfordshire. It’s open 7 days a week, skating sessions last 45 minutes and there are push-along skating seals for littlies. On Mondays (28 Nov, 5 Dec, 12 Dec, 19 Dec) between 5-6.30pm kids can skate with Pikachu and then scoff a tea box and hot chocolate. Adults £9.49, kids under 16, £8.49, Adult & Toddler (Child under 4) £14.99. 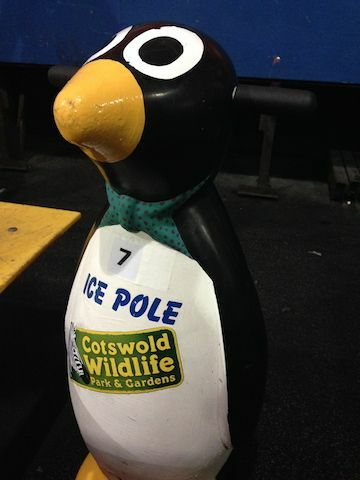 Another local ice rink that is ‘bigger and better’! (note to self, I’d better get my skates on and find out). Frost‘s is the sister garden centre to Millets so it’s the same deal really, open 7 days a week, though opening a week later (Sat 26 Nov), skating sessions are 45 mins, and there are various dates to skate with Picachu – that poor pokemon is going to be exhausted by Christmas. Keep a date in your diary for the Festive Family Fun Night on Dec 11 which includes a welcome drink and mince pie on arrival, unlimited skating for the evening, a family magic show, games on the ice rink, BBQ and a goodie bag for kids. Not an outdoor one admittedly, but worth mentioning because Oxford Ice Rink is one of the biggest in the area by a country mile. 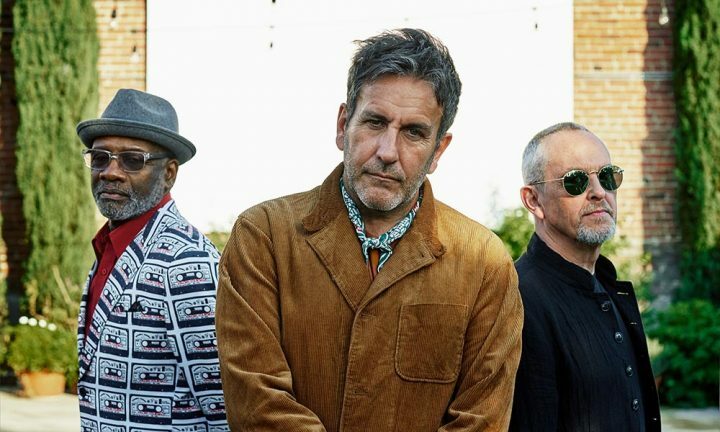 Littlies can waddle around with these push-along penguins (above) and you’ll no doubt be accosted by Slade, The Pogues and and Cliff Richard in equal measure . Another professional indoor facility that you can just drop into as a family, but also worth knowing this one puts on disco nights for the under 13s, party nights for adults, and there’s an Alice in Wonderland Christmas Show on 7 Dec if you’re really a sucker for punishment. There are two rinks here. The main one is under cover and there’s a smaller open-air rink. Thre’s also food and other attractions including an licenced bar and food grill, the UK’s largest dodgems and other rides for kids, indoor viewing in case you get chilly and Windsor’s main shopping centre less than 5 minutes away (just saying). Santa is busy in the week but he’s palnning to rock up on the ice on weekends so the more proficient child skaters can try to pull his beard off. 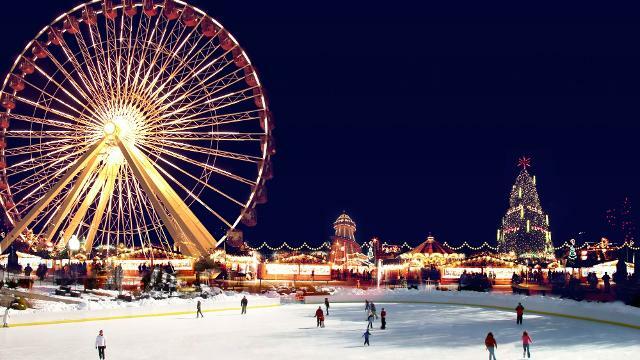 If you’re planning a day in London this Christmas, then Winter Wonderland at Hyde Park should be tickling the top of your must-do list. 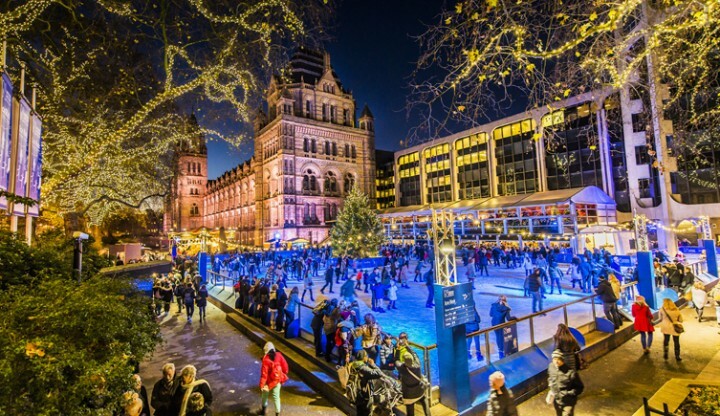 It’s packed with all things Christmassy including the largest open-air ice rink in the UK. Look at it, it’s a whopper and prettily positione too, around Hyde Park’s Victorian bandstand under a canopy of sparkling lights. There are also circus shows, market stalls and rides and attractions that will part you from large wads of cash but meh, what price money? Tickets vary according to times, from £9.50 adult and £7.50 child (off-peak) to £15.50 adult, £10.50 child during peak times. 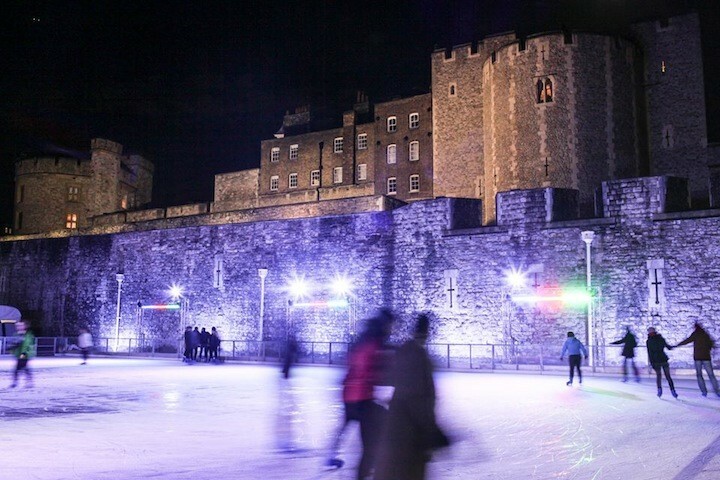 It’s the moat that’s been turned into an ice rink at the Tower. I’m liking the sound of the Eis Haus Ice Experience, where you can sit at an ice bar and sip a cocktail out of a glass also made out of ice – or you could opt for a fondue board and hot choc in the Dip-Dunk Lodge. If you’re getting the impression I’m more into the post and apres skate, you’re goddam right!